Jennifer moved to L.A. in search of an entertainment career. She encountered a competitive industry that forced her to improvise and learn the power of fitness! I grew up on a TINY farm town in Southern Illinois, adopted by the BEST parents in the world! I was born without any legs, yet never realized I was any different. Thanks to my mainstream upbringing, I knew NO limits and NOTHING was impossible! I competed in softball, basketball, volleyball, and power tumbling against able-bodied athletes. However, I knew absolutely NOTHING about REAL nutrition, fitness, or working out. I had never met a vegetarian or vegan in my life. People like that just didn't exist in my "world." I entered the entertainment world in 2008 when I moved to Orlando, Florida to work at Disney World. I was a small town girl coming from tractors, fried food, and cornfields; growing up with absolutely NO concept of a diet and/or workout program. What I encountered would change my life forever. I started seeing acrobats and aerialists everyday and thought, "I can totally do that!" So, I started looking for people to work with and/or teach me. My manager linked me up with Nate Crawford, a seasoned acrobat and aerialist. He immediately took on the challenge and showed me the ropes! I was a natural, and fell in love with performing. For the next five years, I got the opportunity to travel around the world and perform for people at amazing shows. All of the performers looked like statues that had been chiseled out of stone! I never thought I could look like that! I shed a little bit of weight just from the acrobat training, but still wasn't where I wanted to be. I decided to move to Los Angeles in 2011 to further my career as an acrobat/aerialist. Talk about statues, they were everywhere! This was a whole new level of fitness and "beauty." As I quickly found out, the better you look in this industry, the more you work! I had desperately wanted to find that "perfect" trainer because I knew I needed someone to specialize the workouts for me. Well, that perfect trainer happened to be Eric. He came into my life in June of 2011 and was the BEST thing that could have ever happened to me. I met Eric on a Saturday and was at my first workout/consultation on Tuesday. I was ready to rock! When he showed me everything that I had to stop eating I was so sad! I LOVE food and I didn't want to give those things up, but I wanted my career to be successful more than I wanted to indulge in crazy food. So, the next week I started going to bed between 9-10 p.m. and cut out A LOT of food I had been eating (bread, pasta, rice, potatoes, bananas, peanut butter, cereal, etc). My trainer was always the MOST positive, nice, and genuine person at all times. He took the challenge of training a person without legs full on. His method for working out women primarily focuses on their lower body. How would this work for me? We did a lot of brainstorming and trial by error. The first couple sessions were experimental to see how many of his methods would work for me and how we would need to alter them. Surprisingly, not much had to be altered; I was able to do all of the exercises everyone else did. The biggest challenge was having 100 percent focus on making sure my thighs replicated the same movement and motion that everyone else created with their legs. In the beginning, my range of motion was limited, but now it's MUCH easier for me to target specific areas. 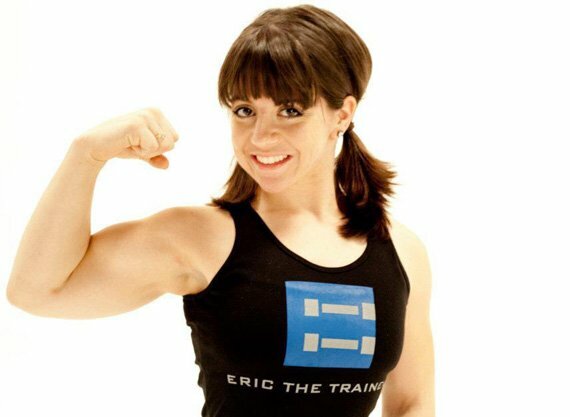 Jen Bricker- 30ft Rope Climb! All in all, it really wasn't as hard as we thought it'd be. Now, I workout and do the same exercises the other women do. Where there's a will, there's a way! Eric created such a positive and uplifting environment. I looked forward to and got excited about working out! Eric's amazing can-do positive attitude is what made this transformation possible! After finishing my transformation and getting a lot of great advice from Eric, I saw that I was more than JUST a performer. My career goals have expanded tremendously; I know I can do ANYTHING! I have a huge passion for acting, speaking, and hosting. Some of my career goals are to write a book, be in a movie, be on the cover of a fitness magazine, and to become a TV host/personality. I was recently featured on Inside Edition, Good Morning America, 20/20, and Glee. I'm still traveling and performing all over and pursuing my career as an on-camera host! Throughout the day I would drink LOTS of water and slowly taper off drinking after 7 p.m. so I wouldn't wake up throughout the night. These are the core exercises I use throughout the week. The exercises are done in different variations each day. Workouts are done daily for one hour with weekends off. Note: Jen performs these exercises with the direction and guidance of her trainer. She focuses on moving her thighs and is able to nail every leg exercise! My life has been defined by constantly figuring out ways to do what others do and make it work for me. Fitness was NO different. That's why I knew I needed a special person to show me the way! I never in my life thought that I could be in a size 00. Before Eric, you could have NEVER in a million years convinced me that I was able to get that small. I was always so muscular, athletic, and curvy that I actually didn't think my body was made to be thin. I now see that my mind was just telling myself to settle for what I had because what I "really" wanted seemed too impossible. One of the most amazing lessons I've learned so far about life is that it will constantly surprise you if you are open to it. Things that you could never predict will happen (opportunities, people, and love). If you are open to it, all of that and more will absolutely rock your world and make life so unbelievably exciting and adventurous! Be up for the challenge, take life head on! Live with NO regrets!